We were approached by Hertfordshire County Council to create a logo and advertising campaign for their new road safety initiative, ‘Put it Away’. 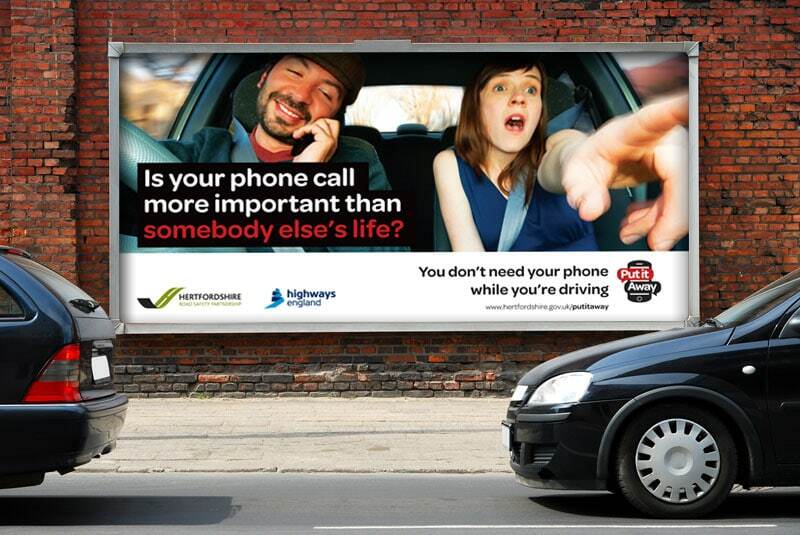 The aim of the campaign was to educate drivers about the dangers of using a mobile phone whilst driving. We created a logo that clearly communicated the campaign’s message using strong bold colours that would stand out and form part of the message on all advertising. The advertising was to be rolled out across both digital and print media. The Hertfordshire Road Safety Partnership had carried out extensive research into which age groups were most likely to use their mobiles whilst driving. Different messages were required to target each age range. Facebook was used for the digital part of the campaign – its advertising platform was perfect to target the specific groups. InSync sourced suitable imagery that would convey the campaign messages for each age range. The Facebook campaign started in early January and runs through to mid February. In addition to the digital campaign a print campaign was also launched. Unlike the closely targeted Facebook ads, a much broader message was used to appeal to all drivers. We designed the printed adverts to communicate the message through impactful images and simple, clear text – using the logo as the sign off to the message. The print campaign was rolled out throughout Hertfordshire across posters, billboards, on buses and petrol pumps.